Aintree - I Say Ding Dong Shop - Buy Stickers, Decals & Unique Automobilia. 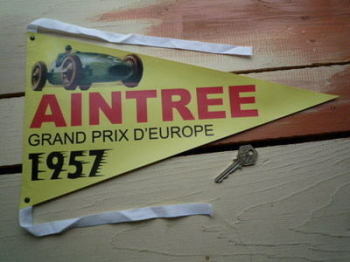 Aintree Grand Prix D'Europe 1957 Pennant Banner. 12" or 15". Aintree Grand Prix D'Europe 1957 Pennant Sticker. 4". Aintree RAC Daily Telegraph 1955 British Grand Prix Car Shaped Sticker. 7".